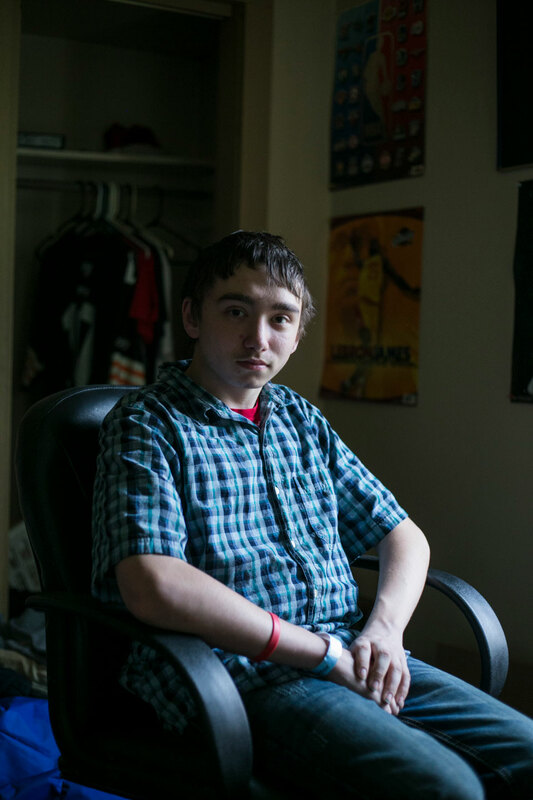 Long before the social workers showed up in his living room this March, Matt McLaughlin, a 16-year-old with diabetes, had taken to a wearying evening routine: trying to scrounge up enough spare change for food while his mom, Kelly, went to a neighbor’s house to use heroin. On a good night, the bookish high school junior would walk through his neighborhood in Andover, Ohio, a Rust Belt town surrounded by fields and trailer parks, to pick up frozen pizza from the Family Dollar. On a bad night, he’d play video games to distract himself from his grumbling stomach and dipping blood sugar, and wait for Kelly to return with glazed eyes. On a sunny Tuesday in March, I accompanied Kerri Mongenel and Tim Kiefaber, two caseworkers from Ashtabula County Children Services, as they drove through the cornfields to Kelly’s house, a duplex with peeling paint and blankets covering the windows. A few days earlier, an anonymous tipster had called the police and urged them to check on the family. A rail-thin Kelly, dressed in pajamas, answered the door and invited us in. Then she sat down at the kitchen table, put her head in her hands, and began to weep. By the end of the day, Matt and Kelly had haphazardly packed their bags. Kelly would go to detox yet again. Matt headed to an aunt’s house. He was lucky to have relatives nearby: The spiraling opioid epidemic has disrupted so many families that all the foster homes in Ashtabula County are full. It’s hard to overstate just how pervasive the epidemic feels here. Detective Taylor Cleveland, who investigates drug cases in Ashtabula, told me, “I’m dealing with some ruined home two and three times a day.” Cleveland, who coaches youth soccer and recently adopted a 17-year-old player whose mom overdosed, leads a task force that responds to every overdose in the county. 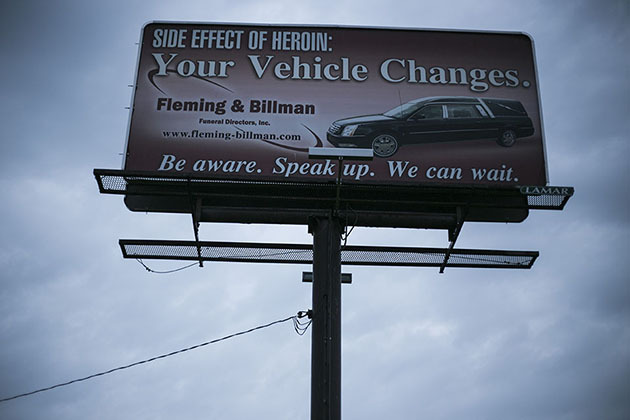 Once, he arrived at an overdose scene only to realize that the victim slouched over in the motel room was his cousin, whose young daughter had called 911. “Every OD that happens, I get a text. I’ve gotten two texts while we’ve been talking.” We’d been talking for less than an hour. Mongenel, 33, has lived her whole life in Ashtabula County. Now in her ninth year as a social worker, she has perfected the code-switching that casework requires: She’s gentle with crying toddlers who don’t understand why they can’t see their parents, playful with teenagers over coffee check-ins, and unyielding with doctors who refuse to see the children she calls “my kids” because of insurance complications. When she’s not working, she’s taking care of her own four-year-old, enjoying her vinyl collection, or “mowing” (which is like driving an all-terrain vehicle, except using a lawn mower with the blade up instead). She and Kiefaber typically work as a pair, and they sometimes jam on guitars they keep at the office. Both had tough childhoods: Kiefaber was a foster kid, and Mongenel was raised primarily by her grandmother. “I see myself in so many of these kids,” she says. 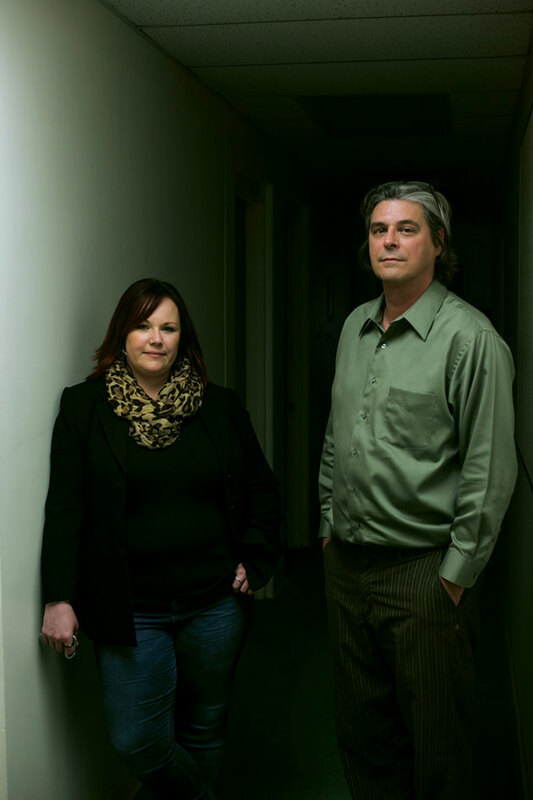 “I can’t remember the last time I removed a kid and it didn’t have to do with drugs,” says Ashtabula County social worker Kerri Mongenel, shown here with her colleague Tim Kiefaber. During my visit, Mongenel introduced me to some of her other clients on the condition that I not use their real names. There was Amber, a 16-year-old with long dark hair and big eyes whose mother, Emily, was in and out of rehab for the better part of a year. Mongenel grew close to the mother-daughter pair, both of whom were outgoing and moody and the life of the party. Amber was placed in a group home while Emily cycled in and out of rehab. “There were nights I would go home and cry because she would call me and say, ‘I relapsed again,'” says Mongenel. “And it was like, ‘Okay, let’s try again.’ Try again, try again, try again, over and over.” In December, Mongenel got the phone call that Emily had been found dead, slumped over in a motel bed, and had to break it to an inconsolable Amber that they had run out of chances. Today, Amber wears her mother’s ashes in a tear-shaped necklace and lives in a bustling house with nine other foster kids. I also met Lisa, a pudgy 10-year-old whom Mongenel and Kiefaber met for the first time in a conference room at her elementary school. Sitting in a chair much larger than she was, Lisa wore leggings and a pearl headband. Her lip quivered. “We’re from children’s services,” said Mongenel gently. “Have you ever heard of that before?” Lisa nodded—they’re the people who go to her friend’s house once a month to make sure everything is okay, she explained. Mongenel asked questions like, “Do you have enough to eat?” and “Do you like where you’re staying?” and “Do you know what drug use is?” She didn’t say she had just visited Lisa’s house and found Lisa’s father strung out on heroin in the bedroom they share. Lisa’s bed was a pink sleeping bag on a piece of foam surrounded by pill bottles. Children in Lisa’s situation are subject to incredible psychological stress. There’s the immediate trauma of living with an unstable parent or being taken from family and sometimes from school and friends. But there’s also the long-term impact. Dozens of studies have found that kids who undergo traumatic events early in life are more likely to suffer mental and physical repercussions later on, be it substance abuse, depression, heart disease, or cancer. Among the 10 so-called Adverse Childhood Experiences, or ACEs, are emotional abuse, physical abuse, separation from parents, and parental substance abuse. “Every time a child gets into a scary or dangerous situation, it activates their stress response,” explains Dr. Nadine Burke Harris, a pediatrician and founder of the Center for Youth Wellness, which focuses on the developmental effects of childhood trauma. “The repeated activation of their stress response is what leads to the biological condition that we in pediatrics are now calling toxic stress.” Looking at the brains of kids of drug users, Burke Harris says, one would expect to see the signs associated with other types of trauma: an enlarged amygdala, the brain’s fear center; decreased functioning of the nucleus accumbens, the brain’s pleasure and rewards center; and less activity in the prefrontal cortex, which oversees a child’s ability to control impulses and pay attention. Read our interview with Dr. Nadine Burke Harris about the effect of the opioid epidemic on kids’ brains. Mongenel and Kiefaber are familiar with the latest research on ACEs. They know that a child with four or more ACEs is twice as likely as other kids to develop cancer and ten times more likely to inject drugs themselves. 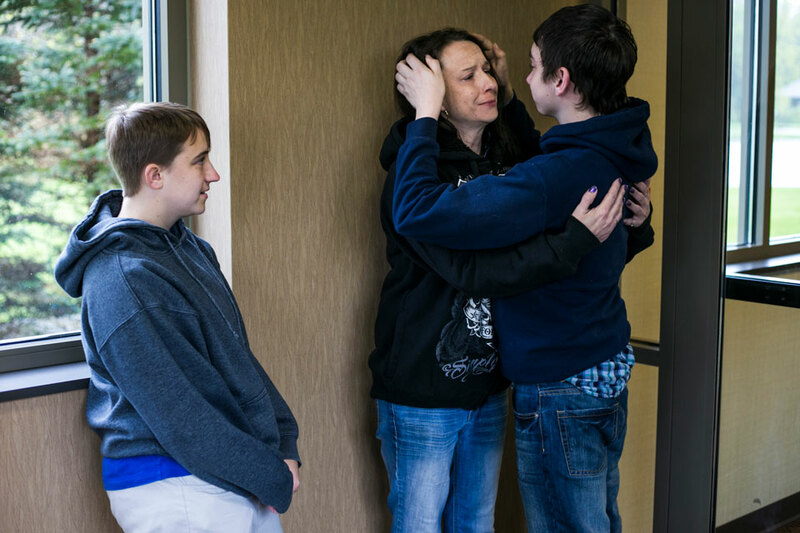 When they encounter someone like Lisa, they are torn between mitigating one ACE, exposure to parental substance abuse, and catalyzing another: separating a child from her parents. Which is what makes these conversations so heart-wrenching. For Mongenel, one of the most difficult things about managing opioid cases is how unpredictable they can be—she never knows how a client’s drug-addicted parent will do after detox. Some thrive and are quickly reunited with their families. Others can’t pull themselves out of the black hole of addiction. A few weeks after leaving Ohio, I asked about Kelly—the mother of Matt, the diabetic teenager. Kiefaber told me that he was optimistic: Kelly had sailed through detox and been sober for nearly a month. I called Kelly, and she really did sound great, clear and full of confidence. “When I was using, I would sleep half the day away” and wake up feeling sick from heroin cravings, she said. “Now I’ve been setting my alarm. I wake up early, enjoy my coffee, open the blinds, and let in the sunshine.” On her walks to town, she said, she crossed the street and looked straight ahead to avoid catching a glimpse of her dealer’s house, an ever-present temptation. Brianna had moved back in to help her mom, but come fall she’d attend college—training to be a social worker. “I’m going to be her first case,” joked Kelly. Brianna and Matt visit Kelly at an addiction treatment center. Hearing all this, I was reminded of other recovering moms I’d met in Ashtabula—women who felt like they’d managed, after years of relapses, to pull themselves out of a terrible dream and today find themselves going above and beyond to show their kids they can be trusted again. “I guess I try so hard to make up for that time,” said one mom, a soft-spoken former nurse’s aid named Joanne Eager who used to turn tricks for drug money after dropping her kindergartner off at school. These days, she prepares elaborate blueberry pancake breakfasts for her kids and makes sure dinner is in the slow cooker before she heads to work. I wrote a happy ending to this piece and filed it to my editor. A few weeks later, midway through a revision of my story, I had a few follow-up questions for Brianna. When I told her why I was calling, there was a long, awkward silence. Finally, she said, “I’m not sure if I’m supposed to say this, but my mom relapsed last week.” She’d gone to pay off her dealer, and the dealer had laid out a line. Kelly didn’t say no. When Kelly told her kids, Brianna fumed. Matt said nothing. Kelly checked herself into inpatient treatment an hour away; Brianna and Matt planned to visit if they could get a ride. Days later, I got a call from an unknown number—the detox center, it turns out. Kelly sounded like the same person I’d talked to a few weeks before, only very, very tired. We chatted for a while about what her days looked like—the hours of therapy and 12-step sessions—and then I blurted out the question that had been plaguing me. How did it go telling her kids she had relapsed? And what about you? I asked. How are you doing? As Mongenel would say: Try again, try again, try again.